This Letter of Understanding (”Understanding”) is entered into on the last date of the signatories hereto (”Effective Date”) by and between the following: Kathleen Martinez, Jesus Garcia, California Council of the Blind and Florida Council of the Blind (hereafter “Claimants”) and Washington Mutual Bank, FA (”Washington Mutual” or “Bank”), for the purposes and on the terms specified herein and operates in conjunction with the Confidential Addendum to this Understanding. Each of the individual Claimants is an individual who is blind or vision-impaired and who currently has, had, or would like to have one or more bank accounts with Washington Mutual or would like to use Washington Mutual Automatic Teller Machines (”ATMs”) and/or would like to access Washington Mutual’s Website and printed materials. Each of the individual Claimants is an individual with a disability within the meaning of Section 3(2) of the Americans with Disabilities Act of 1990, 42 U.S.C. §§ 12101, 12102(2) (”ADA”) and the Title III regulations implementing the ADA contained in 28 C.F.R. §§ 36.101, et seq. (”ADA Regulations”). The Councils have members who are blind or vision-impaired and who currently have, had, or would like to have one or more bank accounts with Washington Mutual or would like to use Washington Mutual ATMs, and/or would like to access Washington Mutual’s Website and printed materials. California Council is a non-profit corporation that provides advocacy services on behalf of blind and vision-impaired persons in the State of California, is dedicated to promoting the well-being of blind and vision-impaired persons, and provides information to the general public about the accomplishments, needs and contributions of blind and vision-impaired persons. California Council is incorporated and has its place of business in the State of California. Among California Council’s members, and those on whose behalf it advocates and provides services, are many individuals with disabilities who hold bank accounts with Washington Mutual or who hold or held bank accounts with other banks and would like to use Washington Mutual ATMs to access those accounts, and/or would like to access Washington Mutual’s Website and printed materials. Florida Council is a non-profit corporation that provides advocacy services on behalf of blind and vision-impaired persons in the State of Florida, is dedicated to promoting the well-being of blind and vision-impaired persons, and provides information to the general public about the accomplishments, needs and contributions of blind and vision-impaired persons. Florida Council is incorporated and has its place of business in the State of Florida. Among Florida Council’s members, and those on whose behalf it advocates and provides services, are many individuals with disabilities who hold bank accounts with Washington Mutual or who hold or held bank accounts with other banks and would like to use Washington Mutual ATMs to access those accounts, and/or would like to access Washington Mutual’s Website and printed materials. Washington Mutual does business in California, in Florida and in other states. Washington Mutual provides visually-delivered information to its customers and potential customers in standard print and via its Website and makes available numerous ATMs throughout its franchise. Claimants allege that Washington Mutual does not provide Claimants with legally-required access to its ATMs, Website and printed materials. Washington Mutual alleges that it offers legally-required access to its ATMs, Website and printed materials. Washington Mutual also alleges that, prior to being contacted by the Claimants, Washington Mutual commenced in May 2000 a nationwide program to upgrade and convert or purchase more than three quarters of its inventory of ATM machines to be “Talking ATMs,” including at least one at each unique location Washington Mutual makes ATMs available to the public. Washington Mutual also alleges that prior to being contacted by Claimants, it had used best efforts to design each page of its Website so it complies with any applicable Priority One and Two checkpoints of the Web Content Accessibility Guidelines currently found at http://www.w3.org/ (”W3C Guidelines”). Washington Mutual also alleges that prior to being contacted by Claimants, it had provided Auxiliary Aids and Services to the extent required by the ADA. Washington Mutual has agreed to work with the Claimants to meet the needs of persons who are blind or vision impaired. Washington Mutual and the Claimants enter into this Understanding to memorialize their commitments to each other to work together in a spirit of cooperation to provide individuals who are blind or vision impaired with further effective access to Washington Mutual’s printed materials, Website and ATMs. In entering into this Understanding, Washington Mutual does not admit, and specifically denies, that it has violated or failed to comply with any provisions of the ADA, any applicable laws of any state relating to accessibility for persons with disabilities to public accommodations, any regulations or guidelines promulgated pursuant to those statutes, or any other applicable laws, regulations, or legal requirements. Neither this Understanding, nor any of its terms or provisions, nor any of the discussions connected with it, shall be construed as an admission or concession by Washington Mutual of any such violation or failure to comply with any applicable law. Neither this Understanding, nor any of its terms or provisions, nor any of the discussions connected with it, shall be construed as an admission or concession by the Claimants with respect to technology, the requirements of any applicable law or Washington Mutual’s compliance with such applicable law. This Understanding and its terms and provisions shall not be offered or received as evidence for any purpose whatsoever against Washington Mutual, in any action or proceeding, other than a proceeding to enforce the terms of this Understanding. Americans with Disabilities Act or ADA means the Americans with Disabilities Act of 1990, 42 U.S.C. § 12101, et seq., and its Title III implementing regulations, 28 C.F.R., Part 36, including Appendix A, the Standards for Accessible Design (hereinafter “Standards”). Automated Teller Machine Location or ATM Location means a “location” as that term is used as of the Effective Date in the “Find Us” Locator page of Washington Mutual’s Website, whose current Website URL is http://www.wamu.com/. Auxiliary Aids and Services means effective methods of making printed materials available to Persons with Vision Impairments. Auxiliary Aids and Services can include, for example, among other things, taped texts, audio recordings, Brailled materials, electronic mail, large print materials, posting on a Website page meeting applicable W3C Priority One and Two Guidelines or Washington Mutual staff who are qualified to read the contents of the printed materials. No Auxiliary Aids and Services will be required by this Understanding unless the ADA so requires. 1.4 Existing ATM Locations means Washington Mutual ATM Locations existing as of the Effective Date. Function means a task or transaction that an ATM is capable of performing. Examples of ATM Functions available on Washington Mutual ATMs as of the Effective Date include the ability to dispense cash, accept deposits, provide account balance information before and after a transaction, and transfer money between multiple accounts. Rollout Locations means Existing ATM Locations, and includes ATM Locations where Talking ATMs are deployed during the Pilot Project. Tactilely Discernible Controls means operating mechanisms used in conjunction with speech output that can be located and operated by feel. When a numeric keypad is part of the Tactilely Discernible Controls used on a Washington Mutual Talking ATM, all Function keys will be mapped to the numeric keypad and the numeric keypad will have an “echo” effect such that the user’s numeric entries are repeated in voice form, except for the entry of a personal identification number. Washington Mutual Automated Teller Machine or Washington Mutual ATM means, for the purpose of this Understanding, a self-service, card-accessed electronic information processing device that dispenses cash and/or accepts deposits, is owned, leased or operated by Washington Mutual, is installed in public locations for the primary purpose of conducting certain financial transactions directly through the device, and is identified with the Washington Mutual name or any other name which Washington Mutual might adopt as a brand name for its ATMs. Excluded from the foregoing definition are ATMs that Washington Mutual leases to another person or entity and which Washington Mutual either does not own or any ownership interest of Washington Mutual is solely to secure repayment of a debt owed to Washington Mutual. Washington Mutual Talking ATM means a Washington Mutual ATM that enables Persons with Vision Impairments to independently access all Functions on the ATM that are available to sighted persons and that are required to be accessible pursuant to the terms of this Understanding. A Washington Mutual Talking ATM has the following features: (1) speech output with volume control; (2) Tactilely Discernible Controls; (3) private audible output of information; (4) the same degree of privacy of user input as is provided to sighted users; (5) ability for the user to review and correct entries without canceling the entire transaction to the same extent that sighted users of the ATM can so review and correct entries for the particular transaction; (6) audible transaction prompts to enable completion of each Function required to be accessible pursuant to this Understanding; (7) audible operating instructions and orientation to machine layout; (8) ability for the user to interrupt (bypass) operating instructions; (9) ability to repeat audible instructions; (10) speech output in English and Spanish to the same extent sighted users can choose these language options at that ATM; (11) audible verifications for all inputs, except that entry of the personal identification number need not be verified audibly with numbers. When the method for ensuring privacy is an earphone, the earphone jack will be placed in an easily locatable position and will be a standard size. Washington Mutual 24-Hour Telephone Customer Service means the toll-free telephone banking customer service that Washington Mutual provides to its customers 24 hours per day for conducting banking transactions and obtaining information about accounts, products and services. Website means the Website for Washington Mutual. The Website URL as of the Effective Date is http://www.wamu.com/. The terms of this Understanding shall remain in effect from the Effective Date until six (6) months after the completion of the Rollout Program described in section 3, below. 3.1 Deployment of Washington Mutual Talking ATMs. This Understanding shall only apply to Existing ATM Locations. 3.1(a) Development and Testing. Washington Mutual, in conjunction with its principal ATM vendor, commenced in May 2000 and has developed and tested, in a controlled laboratory setting, Washington Mutual Talking ATMs. 3.1(b) Pilot Project. At the conclusion of the Development and Testing phase, Washington Mutual installed one Washington Mutual Talking ATM at each of twenty (20) Existing ATM Locations for pilot testing (hereinafter “Pilot Locations”). The Pilot Locations are in the following states: California, Florida, Arizona, Idaho, Oregon, Texas, and Washington. During the Pilot Project, Washington Mutual provided Claimants and their counsel with the scripts and voice files developed for use on Washington Mutual Talking ATMs and Claimants and Counsel provided comments thereon. Washington Mutual has considered and will continue to consider in good faith Claimants’ comments. During the Pilot Project, Washington Mutual solicited input regarding Washington Mutual Talking ATMs from Persons with Vision Impairments. Methods of providing such input included communications with Washington Mutual representatives. 3.2 Washington Mutual Rollout Program – Functionality. 3.2(a) Functions of the Talking ATMs. Washington Mutual Talking ATMs at each particular Rollout Location will provide Persons with Vision Impairments independent access to the following Functions, to the extent that such Functions are available to sighted persons at that Location: (i) account balance; (ii) transfers between a user’s accounts; (iii) deposits to a user’s accounts; (iv) cash withdrawals from a user’s accounts; (v) cash withdrawals from a user’s credit card account when the ATM is accessed through the user’s credit card; and (vi) any other Functions available to sighted persons through Washington Mutual ATMs. 3.3 Locations with Different Types of Washington Mutual ATMs. Whenever a Washington Mutual Rollout Location has multiple Washington Mutual ATMs, the Washington Mutual Talking ATM at that Location shall have all Functions that are available on each Washington Mutual ATM at that Location. In addition, whenever a Washington Mutual Rollout Location has multiple ATMs with varying hours of operation, the Washington Mutual Talking ATM shall have the same hours of operation as the ATM with the longest hours of operation. If Washington Mutual ceases to own, operate or lease an ATM Location associated with its name after the Effective Date, that ATM Location shall no longer be subject to this Understanding as of the date upon which Washington Mutual ceases to own, operate or lease the ATM Location, and such Subsequently-Relinquished ATM Locations shall no longer be considered in assessing Washington Mutual’s rollout schedules. Washington Mutual will promptly provide private listening devices, upon request per Bank policy, from a central distribution location. In addition, throughout the Term of this Understanding, private listening devices shall be available in limited quantities at each branch location following the rollout of a Talking ATM at that particular branch location to enable demonstration of the Talking ATM upon request from Persons with Vision Impairments. Washington Mutual will make good faith efforts to make operational all written comments and suggestions given by the Claimants pursuant to Section 3.1(c), above, provided that such comments and suggestions are consistent with this Understanding and required by the ADA. Within forty-five (45) business days after receipt of any such comments or suggestions, Washington Mutual shall provide the Claimants with a specific response in writing regarding Washington Mutual’s position on each such comment or suggestion. At least every quarter during the pendency of this Understanding, beginning the quarter that starts after the Effective Date of this Understanding, Washington Mutual will provide to the Claimants in writing (if applicable during the reporting period) the address of each Washington Mutual Talking ATM placed during each reporting period. 3.8 Visual and Tactile Signage and Labels. Each Washington Mutual Talking ATM installed pursuant to this Understanding shall have a label that identifies the machine as a Talking ATM. Any text in that label shall be in large print and Braille. Any non-text symbol on the label shall be tactile. 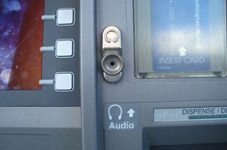 Additionally, each Non-Talking ATM at each Washington Mutual location containing Washington Mutual Talking ATMs shall have a label in Braille and large print stating that there is a Talking ATM at that Location. All Washington Mutual Talking ATMs installed pursuant to this Understanding shall have Braille labels identifying the following components: the earphone jack, deposit slot, card slot, cash dispenser and receipt dispenser. 3.9 Maintenance of Talking ATMs. Washington Mutual will maintain Washington Mutual Talking ATMs in operable working condition at all times except for isolated or temporary interruptions in service due to construction, maintenance or repairs. Should a Talking ATM malfunction, Washington Mutual will use reasonable efforts to correct the problem quickly, consistent with its usual repair protocol and response times. Washington Mutual will continue to use its best efforts to ensure that its websites comply with the Priority One and Two checkpoints of the W3C Guidelines not later than December 31, 2004. The parties recognize that some Priority One or Two checkpoints address features or design elements that may not be used on the Washington Mutual Website and in such circumstances compliance with those checkpoints is not required. The parties understand that certain content on Washington Mutual’s Website is not written or controlled by Washington Mutual (”Third-Party Content”). Washington Mutual’s only obligation under this Letter of Understanding with respect to third party content is to request, in writing, that third parties supplying Web content to Washington Mutual conform their content to the Priority One and Two checkpoints of the W3C Guidelines. To the extent that the Claimants believe Washington Mutual’s Website does not comply with applicable Priority One or Two checkpoints of the W3C Guidelines, the Claimants shall inform Washington Mutual in writing of the alleged deficiency within thirty (30) business days of discovering the deficiency. Within ninety (90) days of the receipt of such written notice, Washington Mutual shall provide the Claimants with a written response regarding Washington Mutual’s position on each alleged deficiency. Should the Parties have a dispute regarding the alleged deficiency, the dispute shall be handled pursuant to the procedures set forth in section 8 of this Understanding. Twice annually during the term of this Understanding, Washington Mutual shall report in writing to Claimants regarding Washington Mutual’s progress toward compliance with Sections 4.1 and 4.2 above. Within three weeks of receipt of such report, Claimants may request additional information regarding the content of the report, provided that such information is relevant to Washington Mutual’s compliance with Sections 4.1 and 4.2. Washington Mutual will continue to provide Auxiliary Aids and Services to ensure that Washington Mutual’s printed materials are communicated effectively to Persons with Vision Impairments. 5.2 Auxiliary Aids and Services Policies and Procedures. 5.2(a) No more than forty-five (45) days after the Effective Date, Washington Mutual will provide Claimants with a copy of documents which memorialize its policies and procedures concerning the provision of Auxiliary Aids and Services. Nothing in Section 5.2(a) obligates Washington Mutual to create new documents reflecting its policies and procedures concerning the provision of Auxiliary Aids and Services. 5.2(b) Within thirty (30) business days after receiving the materials referred to in Section 5.2(a), Claimants shall provide written comments and suggestions, if any, about them to Washington Mutual. Washington Mutual shall consider and use good faith efforts to incorporate the substance of all such written comments and suggestions given by the Claimants, provided that such comments and suggestions are consistent with this Understanding and required by the ADA. Within sixty (60) business days after receipt of any such comments or suggestions, Washington Mutual shall provide the Claimants with a written response regarding Washington Mutual’s position on each such comment or suggestion. 5.3 Elements of the Auxiliary Aids and Services Policies and Procedures. 5.3(a) Washington Mutual Shall Continue to Provide Effective Auxiliary Aids and Services of Its Choice. Auxiliary Aids and Services shall continue to be provided in the areas of ATM services, deposit accounts and lending to consumers. Washington Mutual will provide Auxiliary Aids and Services for its printed materials to Persons with Vision Impairments who request Auxiliary Aids and Services in a manner consistent with Sections 5.3(b) and (c). To the extent more than one Auxiliary Aid or Service is effective to communicate a particular printed material to Persons with Vision Impairments, Washington Mutual may select the effective method of its choice. 5.3(b) Methods for Persons with Vision Impairments to Request and Obtain Auxiliary Aids and Services. Persons with Vision Impairments may request Auxiliary Aids and Services in person at a branch office, over the telephone, or by electronic mail (”e-mail”). Washington Mutual shall provide Auxiliary Aids and Services within a reasonable time after receiving requests therefor. Washington Mutual shall use good faith efforts to ensure that Persons with Vision Impairments do not have to request more than once that a particular printed material be provided by means of an Auxiliary Aid or Service. 5.3(c) Method for a Person with Vision Impairments to Request, and for Washington Mutual to Provide, an Auxiliary Aid or Service Other than that Initially Offered by Washington Mutual. Persons with Vision Impairments may request a particular Auxiliary Aid or Service other than that offered by Washington Mutual for a particular type of printed material. Washington Mutual will accept or reject such requests within a reasonable time frame. Subject to Section 8.4(d), Washington Mutual shall not be required to grant any such request if provision of the requested Auxiliary Aid or Service is not required by the ADA or applicable state law. 5.3(d) No Charge for Auxiliary Aids and Services. Washington Mutual shall not impose any fees or charges on Persons with Vision Impairments for providing any Auxiliary Aids or Services pursuant to this Understanding. However, Section 5.3(d) shall not limit Washington Mutual’s right to charge customers with Vision Impairments a fee equal to that charged to sighted customers for the same or equivalent product or service. Washington Mutual currently has no fees associated with the use of its 24-Hour Customer Service Telephone, live teller assistance and On-Line Banking services. Throughout the duration of this Understanding, Washington Mutual will waive fees for a particular Person with a Vision Impairment, if any are imposed, for these services to the extent their use is the only means available to provide that person effective access to banking information, products or services. Washington Mutual will continue to provide raised line checks for demand deposit and negotiable order of withdrawal accounts to Persons with Vision Impairments who so request, at a cost not to exceed the cost of the most comparable basic checks. A breach of Section 5 shall occur only where Claimants can establish that Washington Mutual has engaged in a pattern or practice of non-compliance with Section 5. The Parties agree that the fact that a Person with Vision Impairment is dissatisfied with a particular Auxiliary Aid or Service offered by Washington Mutual shall not constitute a breach of this Understanding unless such dissatisfaction is caused by a pattern or practice of non-compliance with this Understanding. No breach of contract claims related to Washington Mutual’s provision of Auxiliary Aids and Services under this Understanding may be maintained by persons who are not parties to this Understanding. 6. Training of Washington Mutual Personnel. Washington Mutual is developing a training program to train its employees who serve the public in the areas of deposit accounts and consumer lending in branch locations (including branches located in other retailers’ facilities) or via the 24-Hour Telephone Customer Service regarding the use and operation of Talking ATMs and the Auxiliary Aids and Services policies and procedures. Washington Mutual will train relevant employees regarding the location, use and operation of Washington Mutual Talking ATMs and will instruct such employees in appropriate methods of instructing Persons with Vision Impairments how to use ATMs generally and the Talking ATMs in particular. At a minimum, employees to be trained pursuant to this section shall include employees at all bank branches where Talking ATMs are located and a sufficient number of employees who staff Washington Mutual’s toll-free telephone customer service line to ensure that Persons with Vision Impairments receive accurate and timely responses to questions regarding Washington Mutual Talking ATMs. Such employees will be trained in a timely manner to ensure effective implementation of the provisions of this Understanding. Trained Washington Mutual employees will demonstrate Talking ATMs to Persons with Vision Impairments upon reasonable request therefor. 6.2 Training Materials and Program. No more than sixty (60) days after the Effective Date, Washington Mutual will provide Claimants with copies of its written training communiqués designed to comply with this Section. Within ten (10) business days after receiving these materials, Claimants shall provide written comments and suggestions, if any, about them to Washington Mutual. Washington Mutual shall consider and use best efforts to incorporate the substance of all such written comments and suggestions that Claimants give pursuant to this section that are consistent with this Understanding and required by the ADA. To the extent written materials are provided to Claimants under this, or any, paragraph, the content of such materials will not be disseminated beyond the Claimants, Claimants’ attorneys and any experts retained in this matter by Claimants on a need to know basis. Additionally, unless a copy is needed by a retained expert, copies of the materials shall only be maintained by counsel and all copies shall be either shredded or returned to Washington Mutual upon the expiration of this Understanding, and upon Washington Mutual’s request. 7. Right to Seek Modification Under Certain Limited Circumstances. 7.1(c) There is a method other than Washington Mutual Talking ATMs to provide Persons with Vision Impairments independent access to banking services at Washington Mutual ATMs to the same extent that such access is provided by Washington Mutual Talking ATMs and that such method can be implemented pursuant to the schedules contained in Section 3 of this Understanding. 7.2 Suspension of Performance Under Certain Limited Circumstances Following Notice of Modification Pursuant to Section 8.1(a). Delivery by Washington Mutual to the Claimants of Notice of Proposed Modification pursuant to Section 8.1(a), based upon the conditions stated in Sections 7.1(a), 7.1(b) or 7.1(c), shall suspend for forty-five (45) days Washington Mutual’s performance of its executory obligations under the portion of Section 3 of the Understanding that Washington Mutual seeks to modify. Any such suspension shall not constitute a breach of Section 3 of this Understanding and shall not excuse Washington Mutual’s performance during the suspension period of all other portions of the Understanding not affected by the suspension. Subject to Section 8.4(d), nothing in this Understanding shall require Washington Mutual to continue any banking service or product unless that service or product is the only means available to provide a particular Person with a Vision Impairment effective access to banking services or products that Washington Mutual offers to sighted people. 8.1(a)(1) Which conditions set forth in Section 7.1(a) or 7.1(b) have occurred, or, in the event of a modification pursuant to Section 7.1(c), what alternative technology it proposes. 8.1(a)(2) The factual basis for Washington Mutual’s initial conclusion that the conditions in Sections 7.1(a) or 7.1(b) have occurred, or, in the event of a modification pursuant to Section 7.1(c), the details of the alternative technology and the method by which it provides independent access to ATM Functions required by this Understanding within the time frames set forth herein. Within thirty (30) days of receipt of a Notice provided pursuant to Sections 8.1(a) or 8.1(b), the Claimants and Washington Mutual shall informally meet and confer and attempt to resolve the issues raised in the Notice; except that where performance has been suspended pursuant to Section 7.2, such meet and confer will be held within ten (10) days. As part of the meet and confer process, the parties may exchange relevant documents and/or other information and shall engage in informal discovery in an attempt to resolve the issues raised in the Notice given pursuant to Section 8.1(a) or 8.1(b). Such informal discovery may include, but is not limited to, interviewing witnesses and experts and exchange of additional information or supporting documentation. Any disagreement about information to be provided shall be handled pursuant to the provisions of this section. 8.4(a) If the matters raised in a Notice provided pursuant to Section 8.1(a) or 8.1(b) herein are not resolved within thirty (30) days of the initial meet and confer required by Section 8.2, either party may submit the unresolved matters to binding arbitration as set forth herein. 8.4(b) Arbitration shall take place in California and shall be held before a mutually agreed upon arbitrator. In the event the parties are unable to mutually agree upon an arbitrator, the arbitration shall be held before Judge Rebecca Westerfield provided that she is available to schedule a hearing on the matter within sixty (60) days of the submission to binding arbitration and to render a written decision on the matter within sixty (60) days of the first hearing date. If Judge Westerfield is unavailable, the arbitration shall be held before Judge Eugene Lynch, Judge Coleman Fannin, Judge Edward Stern, Catherine Yanni, or Bruce Edwards provided s/he can meet this time schedule. If neither Judge Westerfield, nor any of the other proposed arbitrators listed above is available within the time frame set forth herein, the parties will attempt to informally agree upon a mutually acceptable JAMS arbitrator. If the parties are unable to agree upon an arbitrator, each party will submit the names of three arbitrators from the list of JAMS arbitrators. In the event there is a name common to both lists, that arbitrator will be used. If there is no name in common, the parties will continue to submit lists of three different JAMS arbitrators until there is a name in common. 8.4(c) Any performance that is suspended pursuant to Section 7.2 herein and is the subject of a matter submitted to binding arbitration pursuant to this section shall continue to be suspended through the date of the arbitrator’s written decision. 8.4(d) Law Governing Interpretation and Application of Understanding. The terms of this Understanding, and the provisions thereof, shall be interpreted and applied pursuant to the ADA, or where the ADA does not provide guidance, pursuant to the laws of the state where the dispute arises. Should there be a conflict between the terms of this Understanding and the ADA or applicable state law, the law shall govern and the offending term will be withdrawn and removed from this Understanding and be of no force or effect. In no event shall Washington Mutual be required to provide any product or service in a form beyond that which is consistent with the requirements of the ADA or applicable state law. For the purposes of this section, the parties recognize that the specific affirmative obligations created by the Understanding do not go beyond what is required by the ADA. Any notice or communication required or permitted to be given to the parties hereunder shall be given in writing by United States mail, return receipt requested, or by email. Attn: John C. Fox, Esq. 10. Publicity Regarding This Understanding and Its Components. 10.1 Information to Bank Customers Regarding Talking ATMs and the Auxiliary Aids and Services Policy. 10.1(a) Within ninety (90) days following the installation of the first non-Pilot Talking ATM, Washington Mutual will provide information about the location of Washington Mutual Talking ATMs on the “Find Us” ATM locator page of Washington Mutual’s Website and through the Washington Mutual 24-Hour Telephone Customer Service. This information shall be updated consistent with the Bank’s practice of updating its ATM locator page. Within thirty (30) days of the Effective Date of this Understanding, Washington Mutual shall provide, via its Website and 24-Hour Telephone Customer Service, information regarding the existence of Auxiliary Aids and Services, and the method(s) by which Persons with Vision Impairments can request such Auxiliary Aids and Services. 10.1(b) Washington Mutual shall provide Persons with Vision Impairments with a description of available Auxiliary Aids and Services upon request made to branch staff or 24-Hour Telephone Customer Service agents or operators. A list of available Auxiliary Aids and Services shall be available in formats that provide effective communication to Persons with Vision Impairments. 10.2 Joint Press Release to Announce Installation of First Pilot Machine(s). The parties will negotiate a joint press release to be issued as soon as practicable after the Effective Date. If the parties cannot agree on the content of the joint press release, either party may send their own press release provided that (i) the content of the press release is consistent with this Understanding; and (ii) a copy of the release is communicated to all parties and their counsel at least forty-eight (48) hours before notification to the press. Except as provided herein, no modification of this Understanding by the parties shall be effective unless it is in writing and signed by authorized representatives of all the parties hereto. This Understanding is for the benefit of the parties hereto only, and no other person or entity shall be entitled to rely hereon, receive any benefit herefrom, or enforce against any party any provision hereof. The parties specifically intend that there be no third party beneficiaries to this Understanding, including, without limitation, the members of the Councils. The performance of Washington Mutual under this Understanding shall be excused during the period and to the extent that such performance is rendered impossible, impracticable or unduly burdensome due to acts of God; riots; civil commotions; wars; hostilities between nations; acts of terrorism; government laws, orders or regulations; actions by the government or any agency thereof; storms; fires; strikes or lockouts; unavailability of technology or parts, equipment or materials through normal supply sources; or any other contingencies beyond the reasonable control of Washington Mutual. If Washington Mutual seeks to invoke this Section, it shall notify the Claimants in writing as soon as reasonably possible, specifying the particular action that could not be performed and the specific reason for the non-performance. The Claimants and Washington Mutual will thereafter meet and confer regarding an alternative schedule for completion of the action that could not be performed, or an alternative action. Any dispute regarding the applicability of this Section, or any future action to be taken, that remains after the meet and confer process will be handled as a dispute pursuant to Section 8 of this Understanding. This Understanding and the Confidential Addendum executed herewith constitute the entire agreement between the Parties relating to the subject matters addressed therein. The provisions of this Understanding are severable, and if any part of it is found to be unenforceable, the other paragraphs shall remain fully valid and enforceable. Each party and its legal counsel have reviewed and participated in the drafting of this Understanding; and any rule of construction to the effect that ambiguities are construed against the drafting party shall not apply in the interpretation or construction of this Understanding. Section titles used herein are intended for reference purposes only and are not to be construed as part of the Understanding. The Recitals are integral to the construction and interpretation of this Understanding and are therefore incorporated into this Understanding in their entirety. By: Washington Mutual Bank, F.A. By: John C. Fox, Esq. By: Scott J. Stilman, Esq. This document is the settlement agreement between Washington Mutual and the blind community. Washington Mutual agreed to install Talking ATMs across the country. It was the first bank to offer Talking ATMs in Spanish. The bank also agreed to give blind people braille bank statements, and make its website accessible. The bank will also give Large Print and audio versions of print information. The bank also agreed to give blind people headphones for the Talking ATMs. Lainey Feingold and Linda Dardarian were the lawyers for the blind community. No lawsuit was filed. Instead, a formal process known as Structured Negotiations was used.